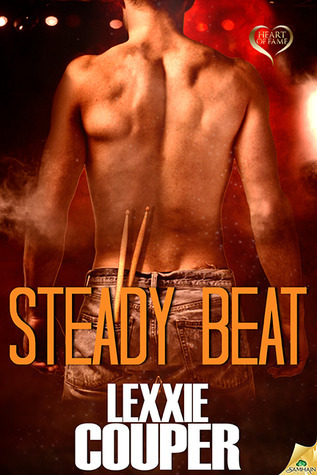 Steady Beat is the next of Lexxie Couper’s Heart of Fame series, and looks at the drummer for Nick Blackthorne’s old band. Noah Holden, Samuel Gibson, Levi Levistan and Jaxon Campbell; collectively they were Blackthorne, the band behind singer Nick Blackthorne. Since Nick’s retirement, each has gone their separate ways, but now, they are considering reuniting to do a song for a film starring mega star Chris Huntley. But there are some concerns to iron out, like what they will call themselves; without Nick, the name Blackthorne makes no sense. And just who will take Nick’s place as lead vocalist? Noah has been at loose ends, after his supermodel girlfriend left him for their dog walker, because she couldn’t deal with Noah’s ADHD mania. When waitress Peppa Kerrigan catches his eye, she proposes a challenge to Noah; a music trivia contest. If Noah wins, he gets a kiss from Peppa, and if she wins, she gets an audition for the lead spot. With Peppa, Noah once again finds his muse, and his inner peace, and when she wins the challenge, Noah agrees to convince his mates to give her a shot. The others agree to listen, and Peppa is determined to live her dream, in spite of crippling stage fright. But Peppa finds she is more suited to managing than singing, and comes up with a marketing plan for the band, as well as a new name. As Noah and Peppa grow closer, Noah is finally grounded, and begins to write songs again, until his old girlfriend Heather reappears with shocking news that rocks Noah’s world. Can the budding relationship between Peppa and Noah survive the news? Can Noah continue to write without his muse by his side? Will Peppa’s audition be a success? I like the world Ms. Couper has built, and the inside workings of her band of musicians is an interesting one. The characters are all well detailed and very real, with faults and flaws as well as talent in their particular forte. I enjoyed watching as Noah and the band made their decisions together about the future of the group, not letting one voice overrule. Noah Holden is hot, talented and more than a bit distracted by his ADHD. His one steadying influence is music, and when Nick retired, Noah was left at loose ends. Easily distracted, his writing suffers and he has no focus, until he meets waitress and aspiring singer, Peppa. After her trivia challenge to Noah, and in spite of what his mates say, he is determined to give her the audition she ‘won’. I liked watching as Noah was finally able to focus his energies and find the calm inside to bring back his music. Peppa Kerrigan has dreams of being a singer, but suffers from crippling stage nerves. I like her determination and her strength, and her willingness to reach for her dreams. I respected her decision that, although she had the talent for her dream, she was better suited to a life behind the scenes, and was trying to succeed without relying on family influence. I enjoyed seeing her come to life as the de facto band manager, and enjoyed the growing romance with Noah. There are some intriguing insights into band life in this, and of course, it wouldn’t be Lexxie Couper without some scorching romance heating up the story. I liked the way the problem of Noah’s ex was handled, with some class and dignity, and no mudslinging or dirty tricks. The acceptance from Peppa for Noah, with all of his idiosyncrasies was the high point for me, and I was delighted with their happy ever after, although it was in question for a short while. I love this world, and can’t wait for more about this talented and hot group of musicians.